When the Rev. Tom Moore was a teenager in Pittsburgh, he never visited Crestfield Camp and Conference Center. Eventually, he took a call with Emsworth United Presbyterian Church in western Pennsylvania, and even though Crestfield remained in his own backyard, it just was not something that he paid much attention to. Tom would eventually come around to the importance of church camp. He invited the staff to his church to assist in Bible school, and would later accept Betty’s invitation to speak at Crestfield. Tom soon found himself as the president of the camp’s board of directors in February of 2017. Despite his new affection for the camp, when Betty announced her resignation and the board started looking for an executive director, Tom was not interested. “In the midst of the process, this was not a call that I sought, and this wasn’t a call that I even had on my radar,” Tom continued. Clearly, Tom was again being drawn to Crestfield Camp, and after having some discussions with a couple of respected colleagues, he decided to throw his hat into the ring for the interim position. He was picked for the job and began his tenure on Aug. 1. The position came open when Betty resigned in late February to become the executive director at Living River camp in Birmingham, AL. At the same time, Paul Humphreys, Crestfield’s program director, accepted a new call back in his home country of New Zealand, leaving the camp in a state of transition. Throw in the fact that Crestfield was and still is in the process of breaking away from Pittsburgh Presbytery to become its own 501c3 non-profit corporation, and it made for a hectic time in Slippery Rock. The Rev. Dr. Bruce Byers immediately stepped in to become the temporary executive administrator as Crestfield looked for its next executive director. Bruce handed over control of the camp to Tom on Aug. 1 for what looks to be a year-long (or more) interim position. However, Tom didn’t rule out the possibility that he may look to have the interim tag taken off his title once a permanent executive director is sought. Tom leaves behind a call at Carnegie Presbyterian Church in Pittsburgh where he spent the last two-and-a-half years in a temporary pastor role. As for the next year or so at Crestfield, Tom hopes to accomplish many things. At the top of that list is for the camp and staff to reconnect with why it is providing the services they do. 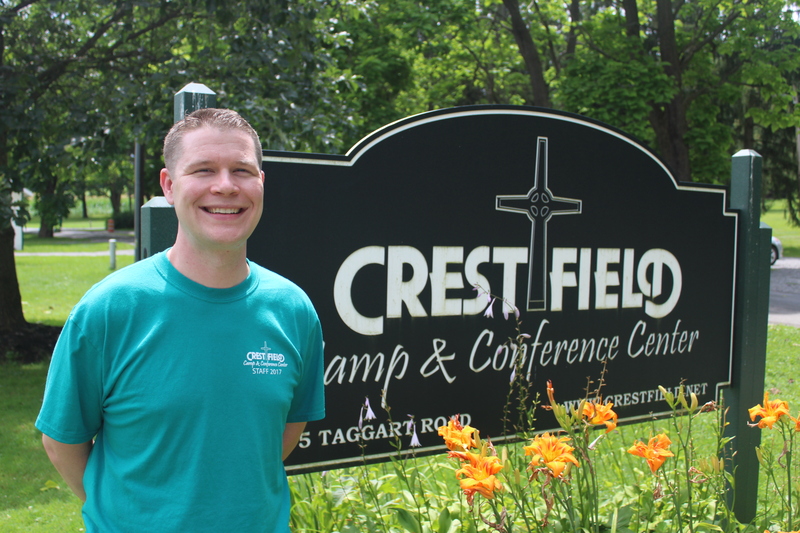 Tom hopes to get feedback from people in the Pittsburgh area who know the camp best to figure out what Crestfield is doing well and what it can do better. Tom also wants to focus on the financial stability of the camp, which has been operating at a deficit the last couple of years. “One of my goals is to help both ensure that we are being as fiscally responsible as possible internally but also putting a greater emphasis on fundraising,” Tom said. A third objective for Tom during this interim period is for the camp to focus on the “conference center” part of its name. That means making it available to groups in the region for retreats and getaways. These goals will come as Crestfield continues down its path to become a 501c3 organization. Having been under the umbrella of Pittsburgh Presbytery in the past, the camp is hoping to become more of a regional facility that will cater to other neighboring presbyteries, thus broadening its pool of perspective campers and clients. “There’s two big reasons for shifting to a 501c3,” Tom said. “There was a recognition by Betty, rather astutely, that a lot of the functioning camp and conference centers for the PCUSA across the country — the ones that are doing the best – all are moving into this direction. The second plus to becoming an independent camp is that it will open more grant opportunities for Crestfield. Tom has experienced that grant agencies will look at camps like Crestfield and because they are tied to a presbytery, which has plenty of assets available, they won’t approve the requests. If these things can be accomplished in the near future, it will result in a camp that will serve western Pennsylvania in a new capacity and with a renewed focus. 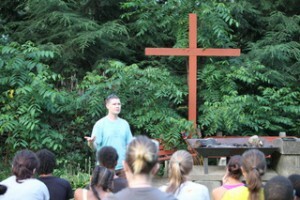 Doing “God’s work in different places” is also something Tom is currently experiencing, even in a location that he never expected – Crestfield Camp and Conference Center.